The new executive director of Great Public Schools Now says a hostile LA Unified board resolution, angry union leaders or public opinion will not threaten the group’s goal to create successful schools, whoever’s in charge of them. If anything, said Myrna Castrejón, the widespread opposition to her organization, its plans and founder, Eli Broad, are providing her a megaphone to “change the conversation” about public education in Los Angeles. Castrejón, a former lobbyist for the California Charter Schools Association, comes to GPS Now at a time of heightened scrutiny, skepticism and outright animus from district officials and parents growing fearful of the financial impact of more charter schools in the district. They’re also not too crazy about any connection to Broad, a philanthropist who has investing heavily in education reform. Officials of the teachers union, UTLA, have accused the group of attempting to “dismantle” public education in Los Angeles, and just this week, the school board went on record opposing the GPS Now plan, of which few details are actually known. Most criticism is directed toward an early draft, which said it wants to spend $490 million to open 260 new charter schools in the district. 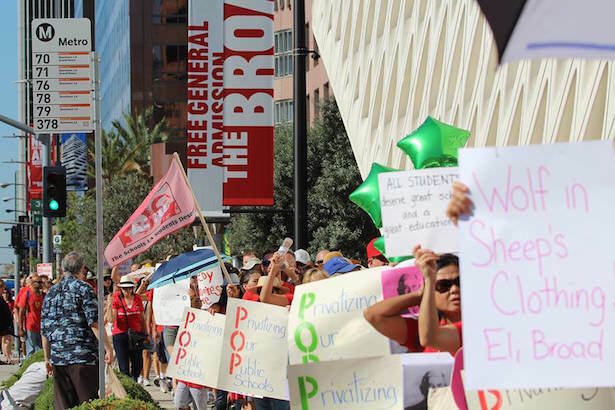 UTLA has been especially critical among the district’s labor partners, pointing to the number of jobs and programs that could be lost with every new independent charter within the district. Castrejón said much of the early draft no longer reflects the organization’s goals, which, themselves, are a work in progress. She also said one of her first priorities will be to meet with board members, the new superintendent, Michelle King, and the UTLA president, Alex Caputo-Pearl, to discuss ways the new group could be helpful to the district. Shannon Haber, the district spokeswoman, said King “is open” to meeting with Castrejón. In the weeks ahead, Castrejón said the focus of the group will be to create a board of a dozen or so beyond the current members — chairman Bill Siart and a seat reserved for a representative of the Broad Foundation — to finalize a mission statement and to start raising money. As far as dealing with critics, the plan is to engage them as much as possible to the degree she can.